This past weekend, my family and I went to our local St. Patrick’s Day parade. This St. Patrick’s Day is special to us… it’s the last “first-holiday” that we celebrate with Ryder. A full year of “firsts” just about done. How the heck can that be. Last year at this time I was larger than a house, prepping freezer meals like it was my job, and finishing up on scheduling out a month full of guest blog post. And now we are coming up on Ryder’s first birthday. How the heck is that possible? 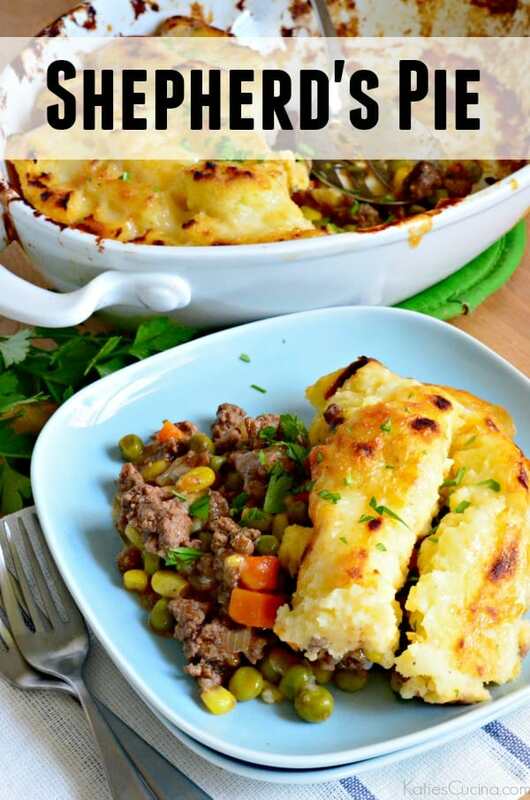 So what does Shepherd’s Pie have to do with Ryder? Well for one thing he ate this Shepherd’s Pie and LOVED it. The kid will eat just about anything in front of him. I love that I’m now able to feed him the same dinner we are having. Granted I did partially rinse off the sauce from the meat and veggies so that it didn’t bother his little stomach. But still–he loved this Shepherd’s Pie. 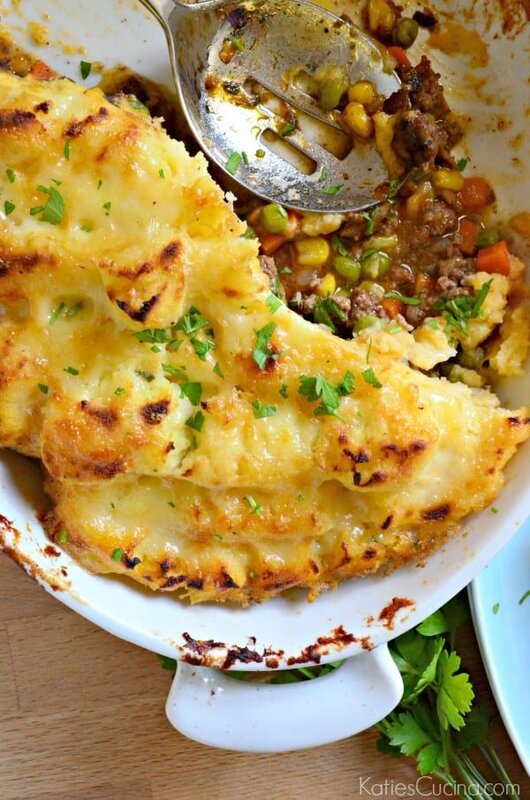 I associate Shepherd’s Pie with Irish comfort food. For some reason whenever I would travel for work or even with my husband and it was cold outside we would always find ourselves in an Irish pub. And you better believe I was ordering Shepherd’s Pie to warm myself up. Even last winter when we went to visit family in NYC we found ourselves at an Irish Pub and me and my 6.5 month pregnant self was eating a big old bowl of shepherd’s pie. The night I made this recipe my husband wasn’t sure he would like it. Some kids grow up eating Shepherd’s Pie. Neither of us did, and it was funny because it was brought up at dinner if we grew up eating Shepherd’s Pie. I remember only eating it when I would eat dinner at friend’s house. My husband never really ate it at all. And after he had just a few bites he asked if this could be put into the regular dinner rotation. Since Ryder loved it I told him yes I would try to make it at least once a month! 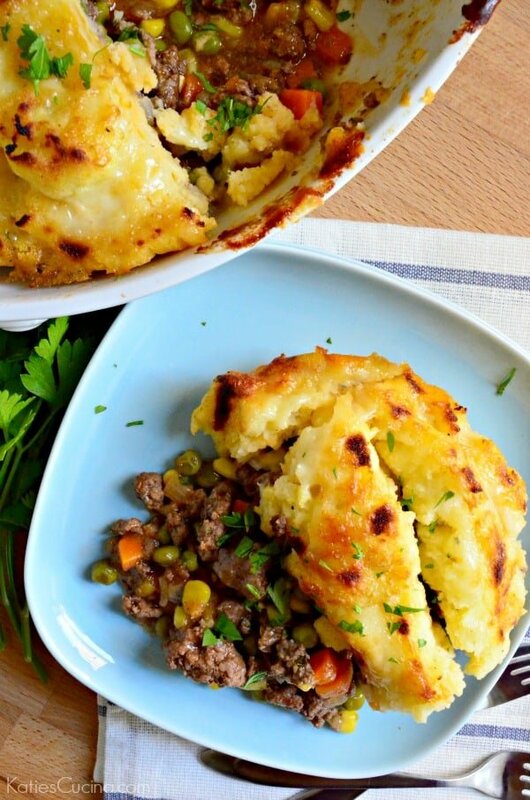 I made this Shepherd’s Pie with lean ground beef verse the traditional way with ground lamb. We don’t care for lamb in our house, so it just made sense to make it with beef–and it was delicious. If you like lamb, feel free to sub it out or maybe even do a half and half mixture. 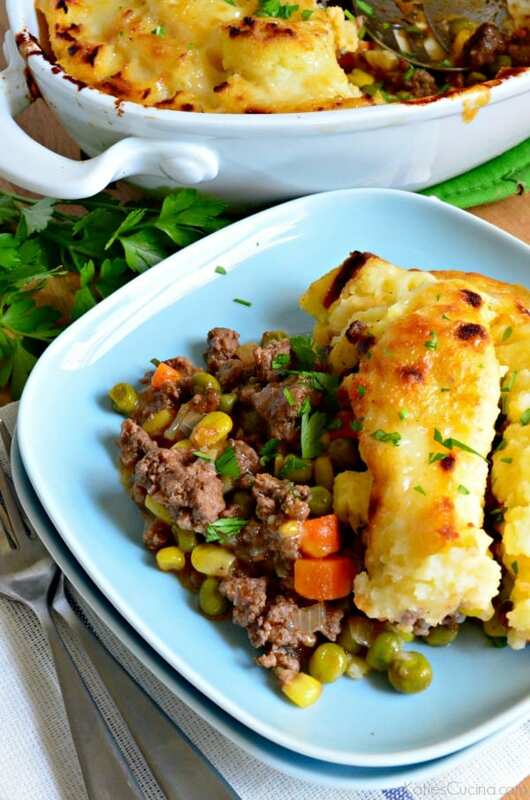 Either way–this Shepherd’s Pie recipe will be a new family favorite! Heat a skillet on high heat. Add the ground beef and cook for 3 minutes, breaking it up until its cooked. Reduce to medium and add the diced onion and garlic. Cook for 1 minute then add in the tomato paste, worchestershire sauce, dried parsley, dried thyme, salt and pepper. Mix together and then sprinkle cornstarch on top of beef mixture. Mix in the beef broth and add in the frozen carrots, peas, and corn. Mix well, reduce heat to medium-low and cook with the lid on for 5 minutes. While beef mixture is cooking place cooked mashed potatoes into a gallon size bag. Place the beef mixture into an oven safe dish. Cut a slit on the corner of the mashed potato bag and pipe the potatoes on top of the beef mixture. Top with shredded cheese and broil for 2-3 minutes until the top of the potatoes are golden brown and cheese is bubbly. Grew up on this stuff !!! I prepared this last night for dinner and it was YUMMY! !